Ever since The Fast And the Furious (IMDB), nitrous has been one of the most banded about buzzwords in the modified car scene, with everyone saying they want it, but only a small number of them actually going ahead and getting systems. Nitrous oxide injection is largely misunderstood, with many people believing that they will damage the engine, or the bottles will explode without warning. This is simply not the case, and is explained in more detail later in this article. Nitrous oxide (N20) is better known in daily life as “laughing gas”, a mild anaesthetic mainly used for surgical purposes since the 18th century. It wasn’t until World War II that it was applied to the internal combustion engine. Aircraft utilised nitrous to provide “emergency boosts” in airspeed capability. It was also used to compensate for the reduced air density and lower oxygen levels at high altitudes. Towards the end of WWII, aircraft engine development was focused on jet propulsion and not piston powered, so nitrous research and development was pretty much abandoned. In the next few decades that followed there were some attempts to use nitrous in race cars, with varying success. Not many people tried it and those that did tended to keep quiet about it, hence it remained something of a phenomenon. In the 1970s things finally began to happen. Several people recognised the potential and companies began to produce systems. Development hadn’t moved much since the 1940s and these systems were more than a little unstable. Around this time two successful auto technicians and racers, Mike Thermos and Dale Vaznaian, recognised that there was a need for a system that was “done right”. In 1978 they formed Nitrous Oxide Systems Inc. Better known as NOS. A company committed to producing kits with only the highest quality components and upmost reliability. NOS lead the way and others followed. Nitrous oxide comprises of 36% oxygen as opposed to around 21% in a normal atmospheric inlet charge. This ~70% increase in oxygen causes more combustion which coupled with additional fuel means an substantial rise in power. The nitrous oxide is stored in liquid form in a highly pressurised (around 1000psi) aluminium supply cylinder. 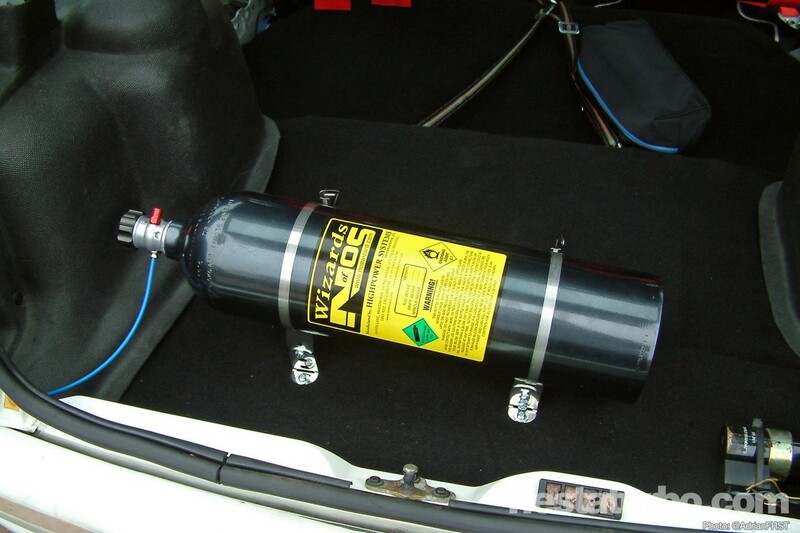 The size of this cylinder is measured by the weight of nitrous it will carry, and ranges from 2.5lbs to 20lbs. Released from the cylinder to the inlet, the reduction in pressure causes its physical state changes to a gas. Once the nitrous is injected into the combustion chamber, the temparature reached on the power stroke is high enough to split the nitrous so that the nitrogen and oxygen molecules are separated. The oxygen is burned and the nitrogen helps to dampen the combustion so that the resulting explosion does not damage the internal engine components. When the nitrous oxide changes from a liquid to a gas it cools the inlet air temperature by 60°-75°F. A general rule is that every ten degrees of reduction in inlet charge temp equals a 1% increase in power. There are three basic types of nitrous systems: Dry, Wet and Direct Port. Dry nitrous systems are so called because the fuel required to produce the extra power with nitrous is supplied by the car’s regular fuel injectors. This means the upper intake is dry of fuel. There are two ways this works: the first is to increase the pressure to the injectors with nitrous pressure from the solenoid assembly. This increases the fuel flow in the same way that turning up the pressure on a garden hose does. The second method is to increase the amount of time that the fuel injector is open and spraying fuel (injector duty cycle). This is done by fooling the ECU and “tricking” it into supplying the extra fuel. In both cases, once the fuel has been added, the nitrous can be introduced and the increase in combustion burns the supplemental fuel to generate the extra power. Due to the limitations of the stock injectors, it is advisable to use jets no higher than around 75bhp. Wet systems are named due to the way they inject fuel into the upper intake, normally 3-4” ahead of the throttle body (ie. in the T U R B O charge carrier pipe on a FRST). Wet systems are best used in Turbocharged / Supercharged applications. This is due to the way fuel flows differently than air or nitrous. This difference can lead to distribution problems and sometime inlet backfires. Inlets designed for wet flow (such as carburetors) cause significantly less separation of the nitrous/air and fuel. As the inlets on a modern fuel injected car are designed to flow only air, they have tighter turns and are often of a more compact design - not ideal for wet flow nitrous systems. Direct Port systems, as the name would suggest, introduce nitrous and fuel direct into each inlet port of the engine. These systems add the two through what is known as a “fogger nozzle”. The fogger nozzle meters and mixes the nitrous and fuel supplied to each cylinder. The system works on the same principal as individual throttle bodies - it allows for the precise control of both fuel and nitrous for each individual cylinder for optimum performance. A direct port system contains a distribution block and solenoid assembly with tubes supplying the nitrous and fuel to each fogger nozzle. Direct Port is the most controllable and accuate method of nitrous injection, although installation is fairly complex due to the need to drill and tap the inlet manifold for each nozzle and the plumbing must be routed to clear any obstructions. The supply cylinder - containing the pressurised liquid nitrous oxide. This is connected by a delivery hose to an electric solenoid valve mounted on the inlet manifold, which is normally closed. The supply cylinder has “master” valve to open and close the feed to the solenoid. The nitrous solenoid - This valve is opened and closed by a throttle position sensor switch. A metering jet in the solenoid determines how much nitrous will be injected. The valve only opens when the throttle is wide open (WOT). The fuel solenoid (on wet systems) - Opens and closes at the same times as the nitrous solenoid. This also contains a metering jet to ensure the correct amount of fuel is delivered. Fuel is supplied by the existing, or an additional pump. An arm switch - Basically a master on / off switch. If this is off then the throttle switch will not operate the solenoids and the nitrous and extra fuel will not be injected. On dry systems, the kit contains a supplemental fuel control circuit. As well as the engine’s inlet, the nitrous is also distributed to a small bleed orifice which provided a reference source of bottle pressure and a controllable source of pressure to accurately indicate how much extra fuel is required. This pressure is conveyed to a vaccum ported fuel pressure regulator, which performs the function of adding more fuel through the engine’s own injectors. The volume of additional fuel supplied is controlled with an adjustable metering jet in the fuel control circuit. This jet will bleed off excess presure and vent it back thorugh a delivery tube to the inlet plenum. For a mild amount of nitrous 25-75bhp, the engine requires only a couple of changes. The ignition timing will need to be retarded by 2-4 degrees and spark plugs with a heat range of 1-2 steps colder may be required. Exact changes depend on the type of engine, the kit being installed and several other factors. Installation and set up by an expert is always recommended. For larger shots the upgrades to internal engine components are the same as would be made for any other reason. Steel cranks and rods to replace stock cast iron items, forged pistons and an uprated head gasket. Apart from the huge power increases available, the most major advantage that a nitrous system provides is that it is there at the flick of a switch. When the system is not armed, the car will drive as it did before the system was fitted. No lumpy idle, harsh fuel consuption or running hot. No need to run high octane fuel or additives. This makes it the perfect method of tuning for cars used daily, or those with engines that don’t respond well to alternative forms of tuning, the Si 16v’s 1600 Zetec being a prime example. As most nitrous systems with a mild to medium power increase require no internal engine work, they can easily be transferred between engine, unlike turbochargers or high compression NA set ups. Wrong - NOS is an acronym for Nitrous Oxide Systems, and is a brand name not the name of the substance. It’s correct name is nitrous oxide or N20. Wrong - Correctly used and installed a system will not cause engine damage. A minor acceleration of engine wear occurs, due to the extra strain on components, but as it is typically used in short bursts, this wear is largely an insignificant factor. Wrong - all forms of tuning revolve around the desire to get more oxygen into the engine to enable more fuel to be burnt which in turn makes a bigger explosion. Forced induction, big valves, aftermarket camshafts and nitrous systems all improve engine breathing and produce the same results - more power. The method may be different, but the results are the same. Wrong - nitrous itself is not flammable at all, it is however an oxidising agent, which accelerates the combustion process. Spray petrol onto a pulsing spark plug and it will ignite. Do the same with nitrous and it won’t do anything at all. Holding a lit match to the end of a nitrous line and releasing the gas will make the match to burn brighter and quicker. It will not cause the tank to explode. If combustion is already present, ie. a vehicle already on fire, then it will have the same effect it does in the engine - a more volatile fire. There isn’t really anything to worry about from a safetly perspective (providing the system is fitted correctly). Wrong - Although medical grade nitrous has this effect, automotive grade contains a minor amount of sulpher dioxide, an additive to the gas to prevent substance abuse. sulpher dioxide gas is released in the process of biological decay, something you don’t really want to be inhaling! This additive does not affect performance.